Boasting over six cubic feet of cooking space, the Smoke Hollow 44241GW 44-inch Propane Gas Smoker with Window is a great addition to your backyard kitchen area. Whether you want to cook some meat up for your family or you’re feeding a large gathering, this smoker has got you covered. Ample cooking area is provided with the seven different cooking grids included in the smoker. The window on the upper door allows you to visually inspect the cooking process without losing heat. With an adjustable smokestack and push button ignition, you’re ready to start cooking all your favorite foods right away. As you’ll read below under features, this smoker provides two (2) 12,000 BTU stainless steel burners which can handle a lot of meat. If you don’t need that much power and space for smoking then take a look at the Smoke Hollow 38205GW Propane Smoker which is similar to this model but outputs less BTU’s per hour thus saving on LP. When you’re smoking food, you want to know that you have ample room to get all the items cooked in a timely manner. If you’re trying to cook a variety of different items such as ribs, burgers, roast, and chicken, you need different adjustments in your cooking areas as well. Not all meats cook at the same time or to the same temperature. The Smoke Hollow 44-inch cooker offers you seven different racks to successfully smoke your favorite meats. Those racks include items such as cooking grids, rib rack, sausage hangers, and even a rack to make your favorite jerky too. Successfully smoking your favorite meats is all about keeping the temperature low and cooking over time. It can be hard to do if your current smoker doesn’t have a built-in thermometer to keep an eye on things. The Smoke Hollow provides a temperature gauge that is very accurate and allows you to know what your smoker is doing at all times. You can accurately cook your favorite items to perfection without losing heat by opening the door. The powerful 12,000 BTU burners provide you ample heat to make sure you maintain the temperature you need at all times. Upon research, the Smoke Hollow 44-inch Propane Gas Smoker with Window had a total of 66 reviews on Amazon. The rating given by the customers who have purchased and used this model was 3.9 out of 5 stars. That is a very good rating compared to other smokers in the same class. While most people were pleased with their purchase, there were seven people who had small or troublesome issues. The negative reactions to the smoker were items such as the rubber on the door pulling away from the glass after one smoking session, problems getting parts to tighten up, and a breeze blowing around the smoker can put out the burners. Another comment was made that you should only buy this smoker if you plan on cooking a large amount of food all the time. It was not recommended for those who do not intend to fill the smoker to the top with meat or veggies. Overall the reviews of the smoker were in favor of the purchase. Many people were highly pleased with the product and the versatility in cooking that it provided them. The positive views far outweighed the negative in this case. Those positive remarks included … “Hands down the greatest smoker ever” … “Very easy to assemble” … “Everything turned out great” … “Very pleased” … “Five stars!”. In conclusion, the Smoke Hollow 44-inch Propane Gas Smoker with Window is a great option for those looking for a large smoker for their backyard festivities. 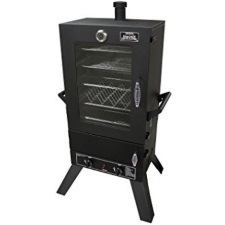 This smoker offers ample cooking room, a door to check on the process, and multiple wood chip baskets to make sure you can easily transfer the wood when you need to. With the multiple types of racks included, you can easily cook up a feast for your entire family in no time. Whether you want to do ribs, make jerky or smoke a delicious pork shoulder, this smoker has got you covered. Research the unit for yourself and find out why so many others love this Smoke Hollow version.